I was recently interviewed about my favourite places in Istanbul. When it came to restaurants, I chose Datli Maya. The shock of my first visit – finding it at random in the cool Cihangir neighbourhood of Istanbul; choosing the food in the entrance hall by the open oven; climbing crooked stairs to the three tables of the minuscule dining zone, past toiling cooks less well-trained in customer relations than the front-of-house folks downstairs; working out how the samovar works. The food is hearty, tasty, good value. Datli Maya makes strong play of the ethical and organic qualities of its offerings. It certainly looks all-natural and goes down a treat. 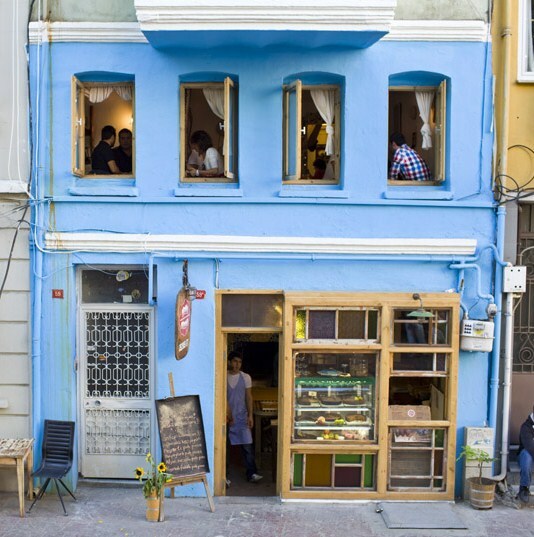 For: tasty food; bohemian, ethnic atmosphere; somewhat off the beaten track yet handy for the main tourist sites in Beyoglu; feels an authentic Turkish dining experience in a cosmopolitan city. Against: simple decor; straightforward waiting staff (not all speak English); no alcohol. Food comes PDQ, so don’t set aside 3 hours for a romantic evening. Name is inexplicably hard to remember. By Robert Pimm in Reviews on 24/10/2015 .